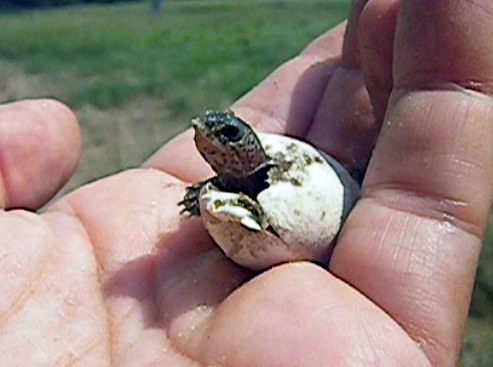 August in the Great White North brings the miracle of birth for tiny turtles that have incubated under New England’s warm summer soil since June. Diamondback terrapins erupt from sandy dunes dotting the coastlines of Cape Cod and Buzzards Bay. 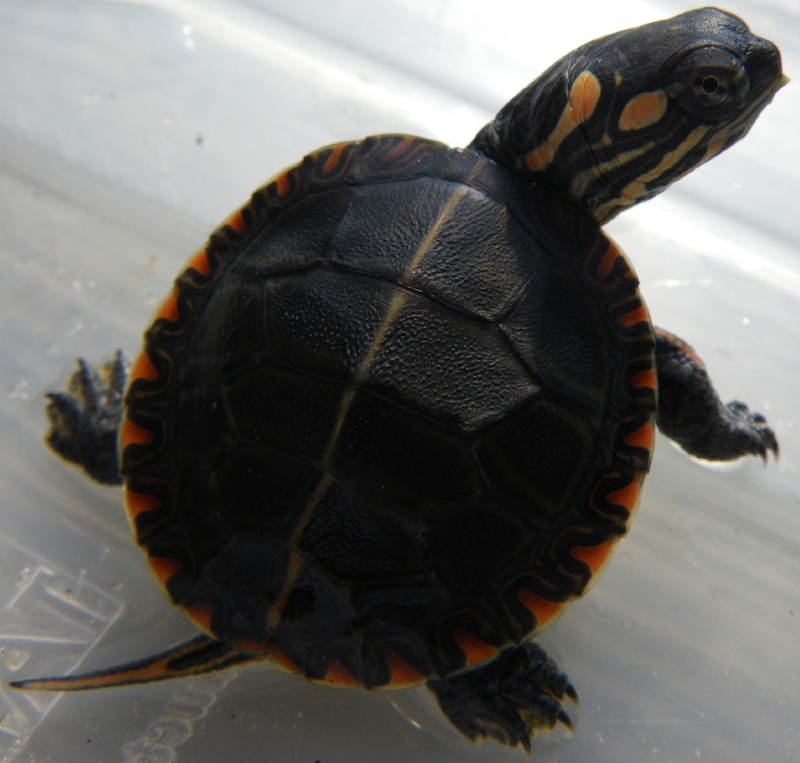 Painted turtles and snapper hatchlings squiggle out of emergence holes surrounding ponds, lakes and rivers throughout the Northeast. Eastern box turtle babies tunnel to daylight in backyards and woodland edges only to disappear under bush and leaf matter for the next several vulnerable years. Perfect pre-autumn days with blue skies and warm rays baking the landscape encourage hatchlings to break for freedom from their subterranean nests. 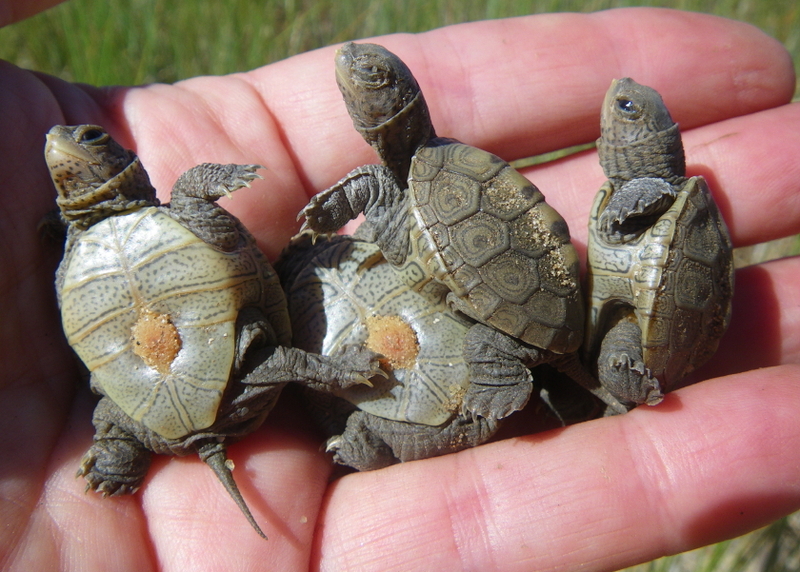 Eggs that have cooked for sixty days under the protection of predator excluders have transformed to perfect miniature turtles ready to take on the world. When they reach the surface, though, they confront an unlikely and unnatural barrier: the wire cage. Little do they realize, of course, that the cage has protected them from the fate of 90% of nests that fall prey to voracious predators. Little do they appreciate that the cage keeps hungry birds from snacking on these potato-chip crunchy treats as they appear from the sand. For these hatchlings, the wired mesh is simply an obstacle that thwarts them from completing their natural imperative: scramble like the wind to find refuge in the thick salt marsh grass. Once nesting begins, Turtle Journal must check cages several times daily to ensure that baby turtles don’t become dehydrated in the hot sun. As they emerge, hatchlings are documented and then given a powerful survival boost by getting escorted across the most dangerous few feet of their lives, from barren sand dune to lush vegetation. Turtles, Turtles, All the Way Down! There’s an old story that is recaptured in Stephen Hawking’s book, a Brief History of Time, about the ancient cosmological fable that the earth rests on the back of a turtle. When a simple country woman was quizzed with the caustic, “What then, madam, does the turtle rest on?” by a pompous cosmologist, she replied without hesitation, “You can’t trick me, young man. It’s turtles, turtles, all the way down.” And so it seems when you’re excavating turtle nests and you find a helical line of hatchlings tunneling to the surface. Hatchling time is a joyous time. Residents who volunteered to protect these threatened critters when they were just tiny white eggs; residents who had guarded the nests in their backyards so tenaciously; residents who had patiently waited and waited and waited as the high suns of July had become the long shadows of late August; for these residents, now is the time of joy when all that protecting and waiting yields a crop of beautiful babies. 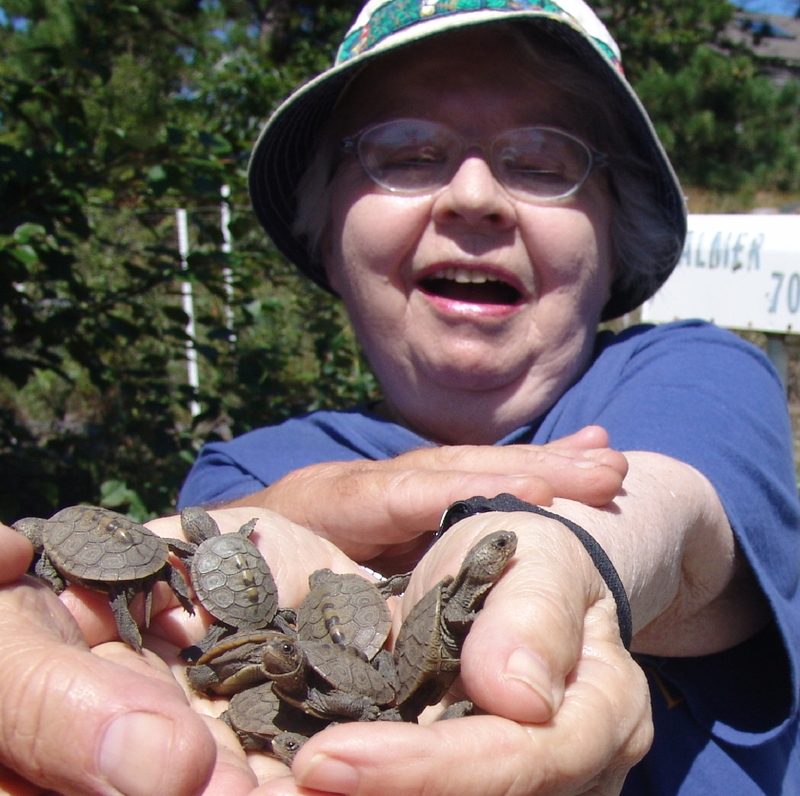 Allison Palmer, our harbinger of spring awakening when she calls each April to report that terrapins have emerged from winter slumber, holds a batch of diamondback hatchlings. 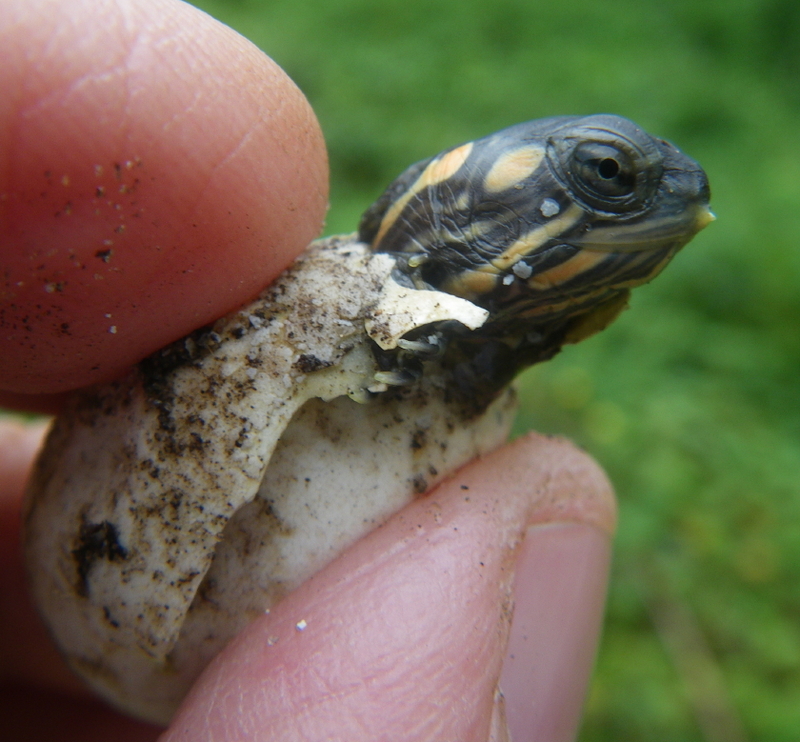 Andrea Pengeroth, who watched with amazement as a mother turtle deposited a nest in her Lieutenant Island backyard, who watered the nest through summer’s drought, and who protected the eggs from all comers, greets a couple of newborn hatchlings. 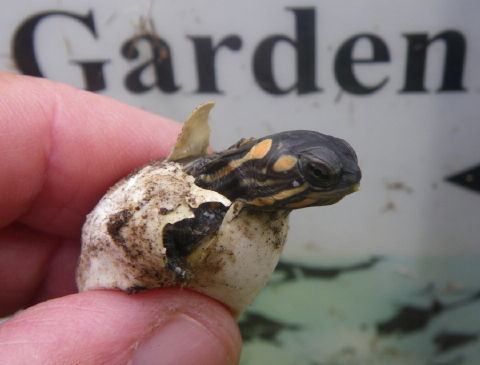 Of course terrapins aren’t alone in this birthing season. 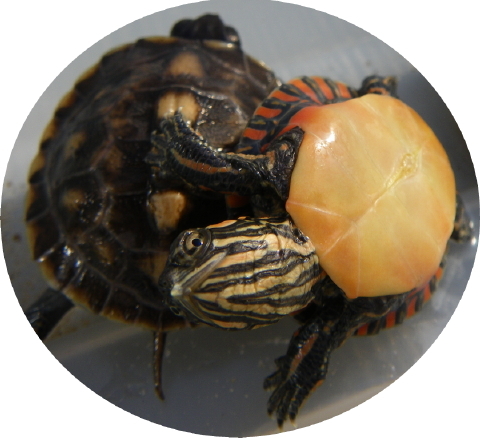 In the Turtle Journal rescue center, we have three species of bouncing babies: terapins, painted turtles and box turtles. Each species has its own unique personality to match its wonderfully different colors and designs. Even from a bottoms-up perspective, they reflect their own individuality as a species. Turtle Dance — But Who Has the Lead? 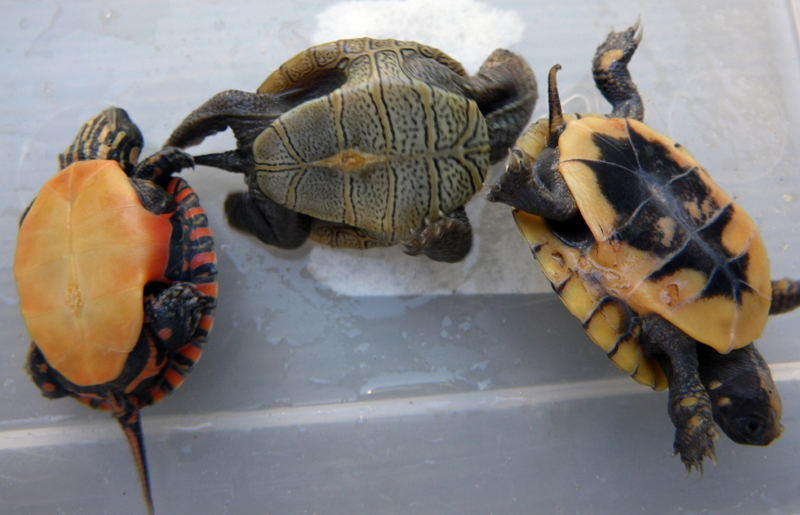 And if you’re looking for antics, you need go no further than wathcing a painted turtle and a diamondback terrapin engage in faux dance step. Painted turtles are faily ubiquitous and are not listed as endangered within Massachusetts. Still, as we develop more and more of their natural habitat for our own purposes, these turtles too suffer from the pressure of human modernity. 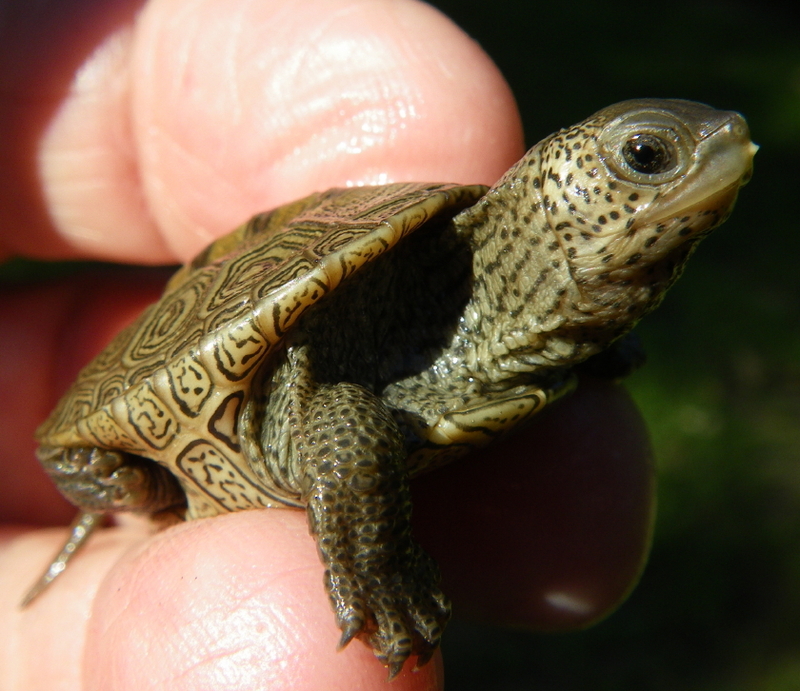 The lumbering Eastern box turtle is a species of special concern in Massachusetts. This little hatchling was protected from a nest dug on the edge of the busy Route 6 highway in Mattapoissett. 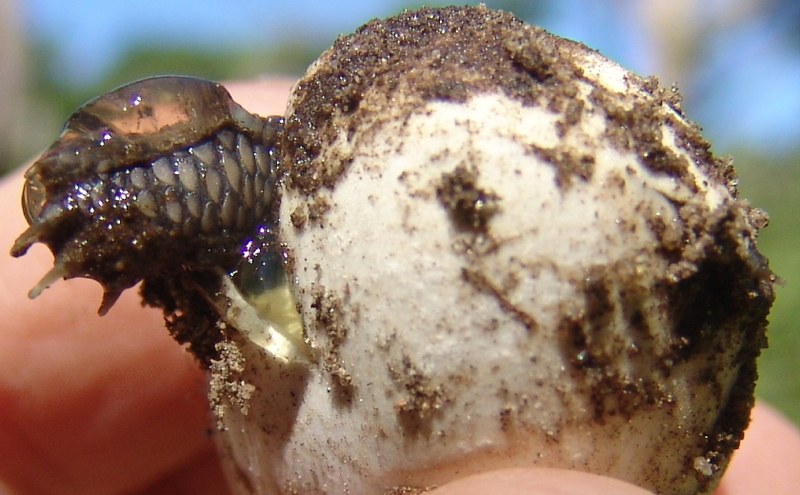 Welcome to the hatching season! 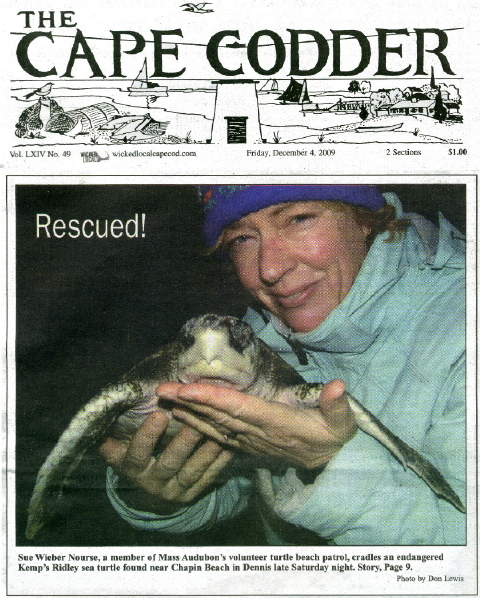 Rocky Mountain’s November rescue from the storm-tossed, high tide surf off Chapin Beach in the dead of night made front page news throughout Cape Cod. “A night not fit for man nor beast,” as W.C. Fields might say, with winds howling from the west-northwest at a steady 25-to-30 knots, punctuated by 50 mph gusts. Unfortunately, these are the very conditions in which tropical sea turtles strand each fall on Cape Cod’s bayside beaches. Trapped by the geological seine called Cape Cod jutting forty miles into the North Atlantic, tropical sea turtles become cold-stunned as bay water temperatures plunge below 50F. By an accident of their natural lifecycle, most of these trapped and cold-stunned turtles are two and three year old Kemp’s ridley juveniles, a critically endangered species and one of the rarest sea turtles in the world. So, on this night unfit for humans or reptiles, turtles would be tossed ashore like flotsam and jetsam, condemned to certain hypothermic death unless rescued from the beach by dedicated volunteers. About a quarter mile east of the Chapin Beach ramp, Sue Wieber Nourse of Turtle Journal and CEO Cape Cod Consultants found Rocky Mountain, a small juvenile Kemp’s ridley, rolling in the waves. Measuring a mere 10-inch carapace (top shell) length, the turtle was tossed upside down on the beach. “It looked just like salty brine glistening in the moonlight,” observed Wieber Nourse. She removed the turtle from the receding waves and examined it carefully. She pronounced it “quite lively.” Since Sue had to walk the turtle back into the teeth of the WNW blow, she placed the little critter under her top coat to protect it from the hypothermic effect of the wind blast. After emergency medical care at the New England Aquarium and rehabilitation at New England University, Rocky Mountain was ready to return to the ocean to restore the dwindling numbers of this critically endangered species. Seventeen comrades would join Rocky Mountain on the journey back to the Gulf of Mexico, mostly Kemp’s ridleys with a couple of green sea turtles mixed in for variety. 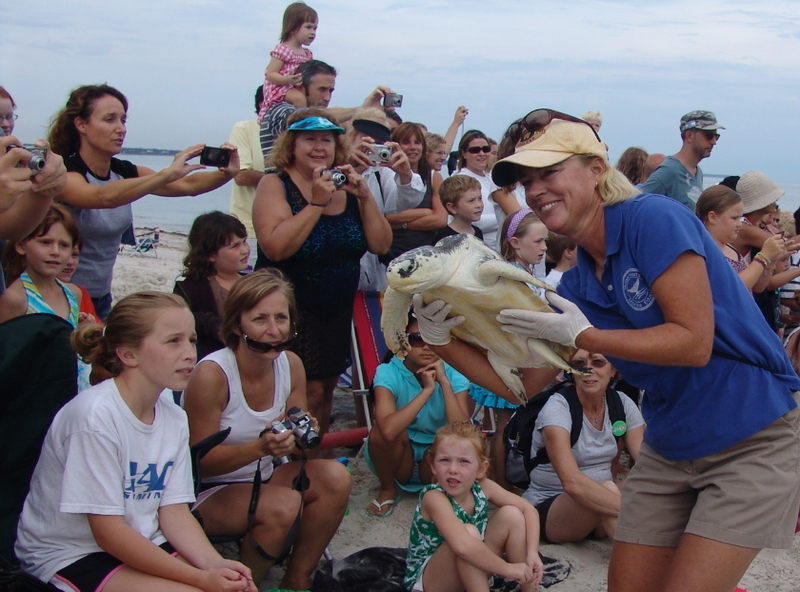 Rocky Mountain’s rescuer, Sue Wieber Nourse, was on hand to show the restored and now healthy Kemp’s ridley to a large crowd of admiring on-lookers who had assembled at Osterville’s Dowses Beach to witness the release. Sue walked Rocky Mountain down the rope line with cameras flashing and children cheering in a scene reminiscent of a presidential campaign appearance. Soon the hoopla ended. 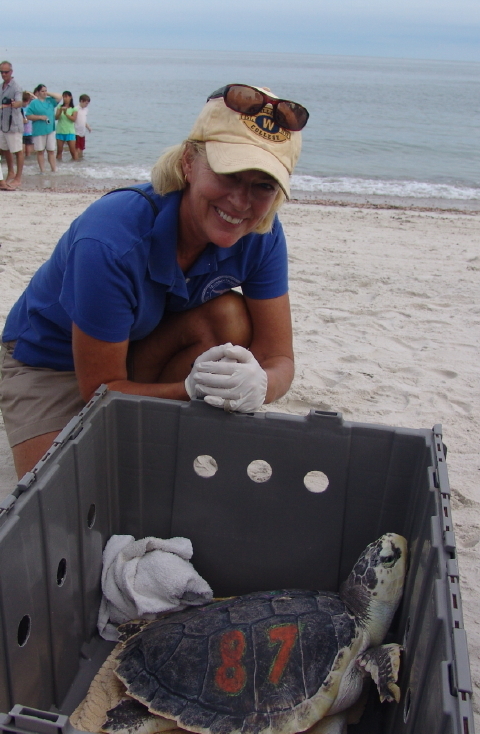 It was time for the sea turtles to race down the beach and to resume their journey southward toward the Gulf of Mexico. Nothing is more rewarding for a rescuer than to be present when these animals return to the wild to fulfill their role in restoring such an endangered species. 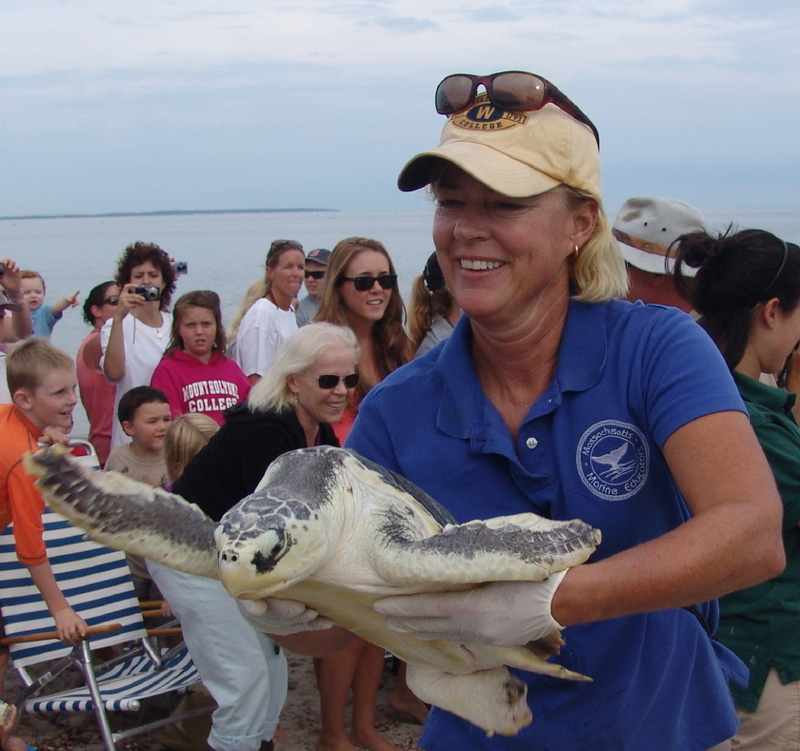 For Rocky Mountain, the full rescue cycle came to a successful close on Wednesday evening at Dowses Beach in Osterville, as this juvenile Kemp’s ridley paddled out to sea in Nantucket Sound. Good luck, Rocky Mountain! It was so nice to know you. Hope to see you on a nesting beach in Rancho Nuevo or Padre Island in another 15 to 20 years. 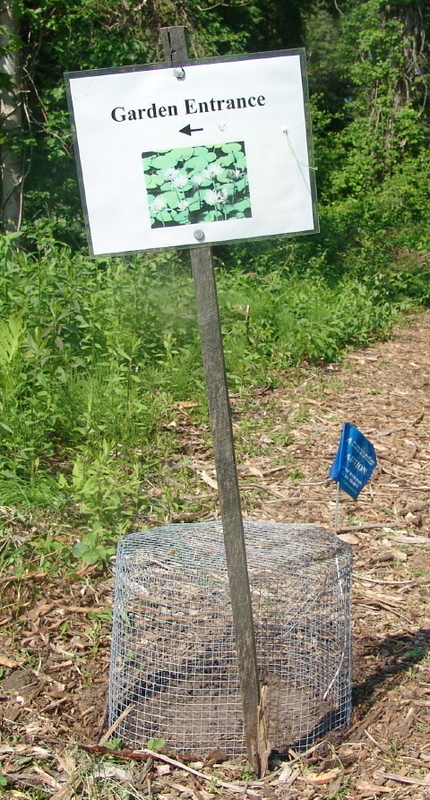 Sunday afternoon brought the first crop of 2010 baby turtles to the Wareham Community Garden off Tihonet Road. Amidst rows of stoplight red tomatoes, glistening peppers and crunchy cucumbers, between swirling vines of yellow crookneck squash and plump orange pumpkins, three painted turtle nests, each holding six eggs, incubated under the golden summer sun, growing to the rhythmic cadence of hoes, rakes and shovels, and watched over by local gardeners who seemed more concerned with their crop of baby turtles than their harvest of sugar snap peas. 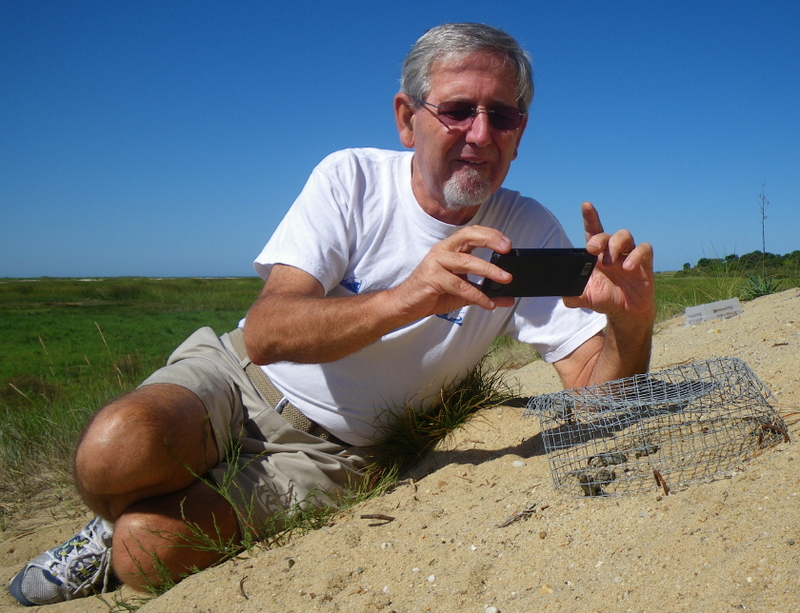 After nearly 80 days of incubation, turtle experts Don Lewis and Sue Wieber Nourse decided it was time to check on Wareham’s turtle crop. They removed the cages and carefully hand-excavated the soil to examine the eggs. 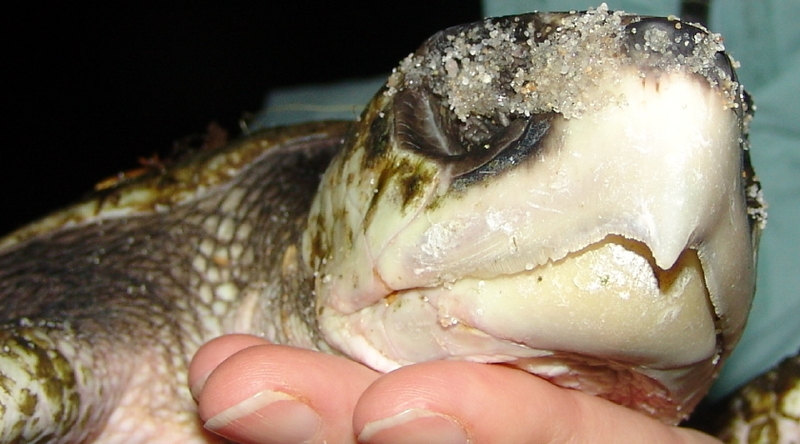 No tools can be as sensitive as fingertips in checking nests for fragile turtle eggs. One plump white egg lay on top of the first nest and bounced on its own when gently stroked, revealing a lively little baby still tucked inside the protective eggshell. As Lewis stroked his fingertip across the second egg, he heard the telltale rasp as though rubbing sandpaper, a sound that indicates that the egg had been “pipped” (pierced) by the hatchling’s eggtooth. 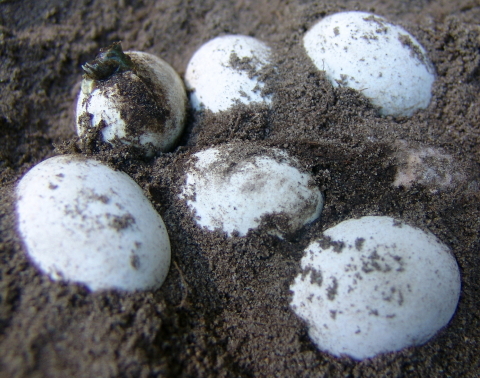 Of the 18 eggs deposited by three female painted turtles, two had pipped naturally, one had succumbed to depredation by roots, one had been destroyed by insects, and fourteen more are waiting their turn to enter the world. About a third of the eggs were significantly dehydrated due to this summer’s parching heat and limited sustained rain, but they’re now being stored in clean moist soil to try to restore enough hydration to help them through hatching. The plan is to return these babies back to the Wareham Community Garden in a couple of weeks, once all the hatchlings have emerged and have become strong enough to take on the whole wild world by themselves. Human partners will have done their bit and the rest will be up to these tiny 1-inch long, 1/4 ounce powerhouses of Nature. 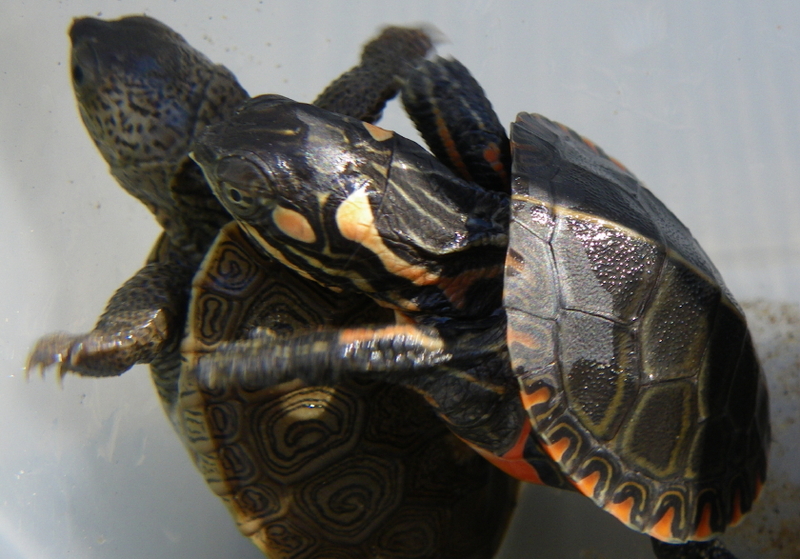 For more than 200 million years turtles crawled and swam through the crevasses of time. With a little help from their Wareham friends, future generation of turtles will be around to teach humans how it’s done. 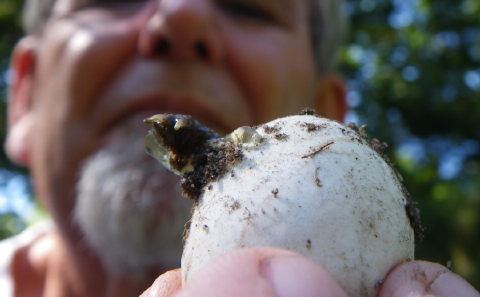 This afternoon we checked a rescued Eastern Box Turtle nest relocated on June 1st to Turtle Journal headquarters. Tom Richardson and his family spotted a female Eastern Box Turtle laying a nest at the edge of the Route 6 highway in Mattapoisett, across the street from the Old Rochester Regional High School. Tom alerted Don Lewis who excavated seven eggs and transplanted the nest into a protected sanctuary at Turtle Journal. At the 60-day incubation mark, we had checked the eggs which appeared plump and developing nicely. 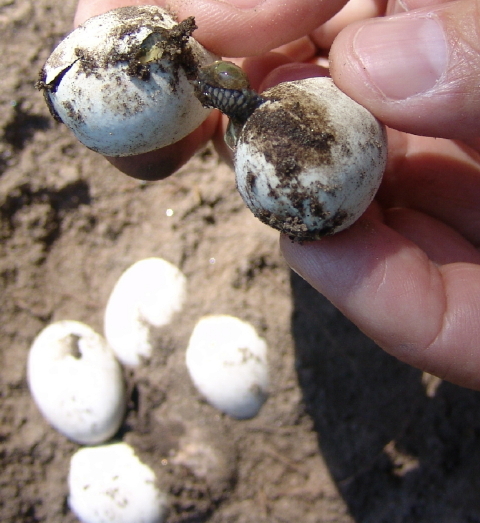 We probed the nest again today and found two hatchlings that had pipped with forelimbs poking through the eggshells. The pipped eggs are top left in the picture and direct center. The egg on the middle right did not develop and was removed to avoid insect depredation as the other eggs pip. To our eyes there’s something beautiful and strange about a headless white egg sprouting two hands that wave about the air in search of freedom. As the summer sun shines this weekend, we expect the other four viable eggs to pip and the two pipped hatchlings to fully emerge. The pipped babies are resting in a warm, moist container in the Turtle Journal sunroom. While we celebrate our first South Coast Eastern box turtle hatchlings of the year, we are still rescuing multiple dozens of diamondback terrapin hatchlings from nests on Wellfleet’s Lieutenant Island each day. 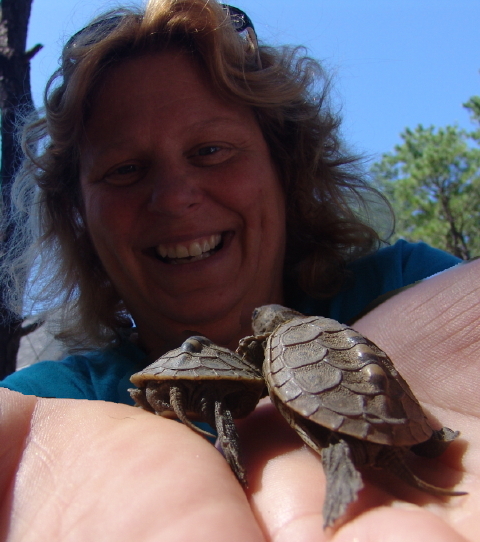 Sue Wieber Nourse patroled the entire island today, finding hatchlings emerging from protected nests and from wild nests. Tiny turtle tracks crisscross the roadways and dunes. While Boston and New York are on Eastern Time and Chicago is on Central, Cape Cod is definitely on Turtle Time from now through the end of September. 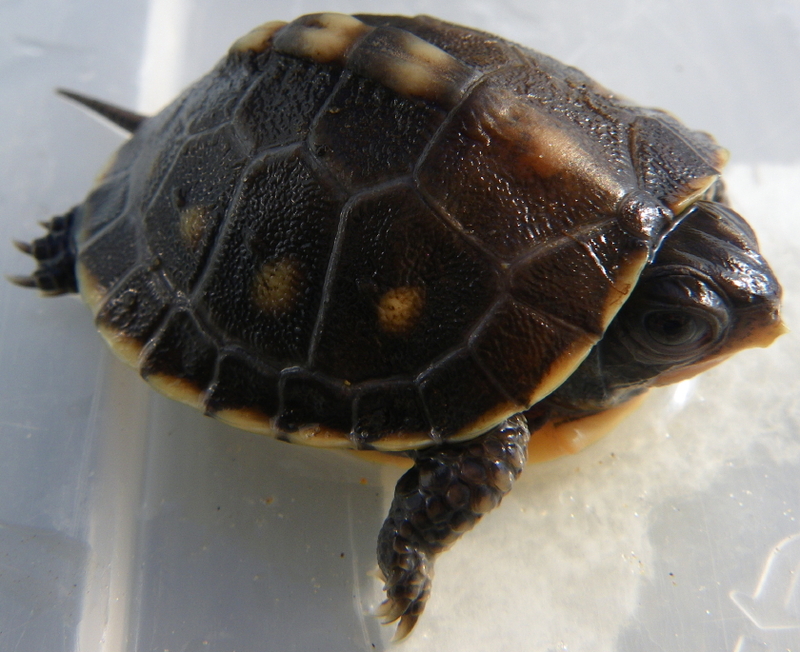 Diamondback terrapin eggs are hatching minuscule turtles earlier than at any point in the past three decades. Long, hot summers produce happy Cape visitors and relaxed Cape residents with fond memories of warm sands, blue skies and even bluer waters. Yet, behind the scenes and under the surface, invisible to the vacationing world above, Mother Nature has been baking its own summer surprise. With an unseasonably warm spring that seduced critters into early mating and nesting, coupled with searing summer temperatures that toasted sandy shorelines under which turtle eggs were buried, the first diamondback terrapin hatchlings emerged Friday on Outer Cape Cod. In south Eastham Mass Audubon volunteer and turtle conservationist Bill Allan found a bayside terrapin nest with eight fully developed hatchlings. Allan reports that the 69 days of incubation for this nest is about five days less than average for this location, another confirmation of the power of summer heat to speed development along. 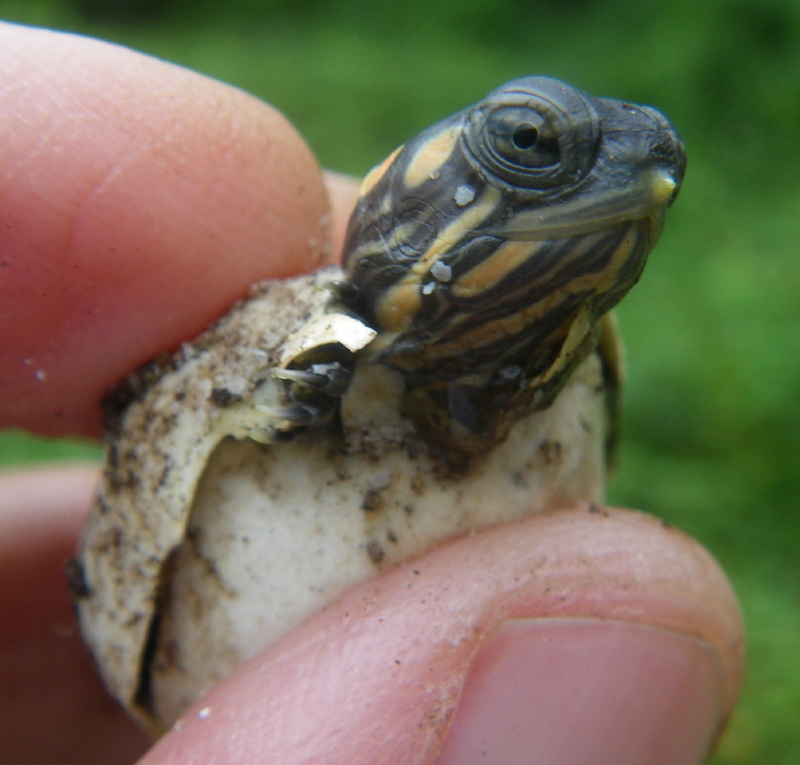 Within the next few days and weeks, baby turtles will emerge from beaches and backyards, from bog paths and dirt roads, from peaceful meadows and busy highway shoulders, from the tip of Cape Cod to the purple mountains of the Berkshires. Turtle mothers deposited their eggs with great care and at considerable risk in springtime. Mother Nature tended the nests with warmth and sunshine through the long summer days. Now humans can do their part to protect the next generation of these charismatic critters. If you spot a “crawling pebble,” take a moment to see that it gets safely into protective vegetation without getting squished by a restless driver or snacked by a voracious predator. Statistics show that very few baby turtles survive, perhaps only one in a thousand. They’re tasty treats for all sorts of animals, and when you’re as tiny as a hatchling, almost everything is big enough to be a lethal predator. Survival depends on quickly scrambling into camouflage and cover where they stand a better chance of beating the overwhelming odds against them. A moment’s help lasts a lifetime when it comes to turtles. For more information about turtles and the rhythm of Nature on Cape Cod, you can follow this unfolding saga of living natural history at Turtle Journal. 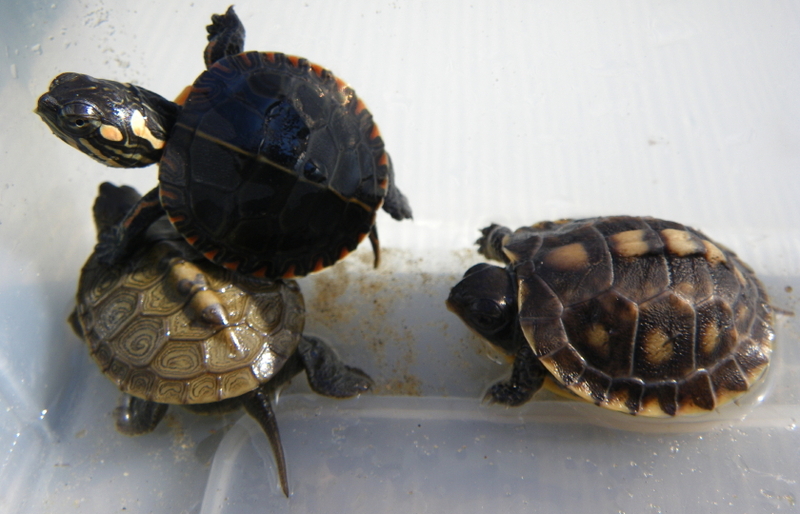 You are currently browsing the Turtle Journal blog archives for August, 2010.